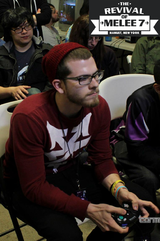 Gahtzu is a smasher originally from Bonn, Germany currently residing in Orlando, Florida, who mains Captain Falcon in Melee. He is often accredited as being the best in the United States at Falcon dittos, having taken convincing wins over top Falcon mains, such as S2J, Wizzrobe, Darkrain, and Scar. He is currently ranked 5th on the Central Florida Melee Power Rankings and 27th on the 2018 MPGR. He was picked up by U4X eSports on September 19th, 2016. He left the team on December 9th, 2016. At Smash the Record, Gahtzu nearly set the Guinness World Record for "Longest Video Games Marathon Playing a Fighting Game" at 72 hours, which would've beaten the former record of 48 hours. Unfortunately, a video error that occurred during his session delegitimized his entire attempt, despite the amount of witnesses that were present. At Hungrybox's Don't Take My Stock 3, Gahtzu beat Darkrain 5-0 in a Captain Falcon ditto money match. Gahtzu's username is a reference to Guts from the Berserk series, as Guts' name is pronounced "Gattsu" in Japanese. Along with Wizzrobe and Gravy, Gahtzu is a member of 20GX, a movement to reinvent and push the limits of Captain Falcon as a character. Gahtzu won two consecutive $100 money matches against premier Captain Falcon player S2J at CEO 2015. Although Gahtzu is proficient in the Falcon ditto, he lost to Lord at GENESIS 3 including a four stock in game one. This page was last edited on April 21, 2019, at 09:23.